Christmas TV History: Witch's Night Out! Happy Halloween! Do you remember this 1970's animated Halloween TV special? Witch's Night Out was created by John Leach and Isobel Jean Rankin in 1978 as a follow up to the 1974 Christmas TV special The Gift of Winter. Both holiday specials feature many of the same characters as well as the same imaginative but simple character design and style. Though first made for Canadian TV, both holiday specials were broadcast in the United States. Watch it here on Veoh. (Sorry, I tried to embed it but it would only copy corrupted). If you watch just the beginning of this video, you can see how the characters are rendered simply but not without their own original and distinctive style. The backgrounds are amazingly complex and colorful. They look like watercolor paintings. This Halloween special is not to be forgotten. 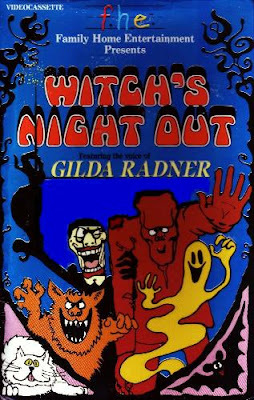 I believe Witch's Night Out has only been released on VHS. But this cult classic is well worth watching. The story of Witch's Night Out attempts to explain the true meaning of Halloween and the joy of wearing costumes. Two children, Small and Tender, are disappointed with their Halloween costumes which fail to scare anyone while they trick-or-treat. Witch hears their pleas to become real monsters and she magically turns Small, Tender and the babysitter Bazooey into a werewolf, a ghost and Frankenstein's Monster! Witch escorts the three monsters to the town Halloween party where they frighten away all the party guests. Eventually, the three monsters learn that it's not as much fun as they had thought to be truely scary and to ruin everyone's fun. The fun is having the opportunity once a year to step outside your normal self and dress like someone or something else. Warning: video footage created by putting camera up to TV screen. argh! Have you ever seen Leach/Rankin's The Gift of Winter? I wrote about in both my books The Christmas TV Companion and Tis the Season TV. The TV special The Gift of Winter attempts to provide a delightful, imaginative explanation for the origin of snow. I just happen to have a brand new, factory sealed DVD of The Gift of Winter. The first person to comment below and to ask for it can have it. Please, North American residents only. I would love to have a copy of The Gift Of Winter,please. 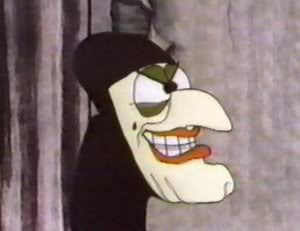 I've never seen it but Witch's Night Out is one of my all-time favorite Halloween specials. We're in the process of reviewing WNO at our blog. I LOVE YOUR SITE. YOU ARE A GENIUS! CHECK OUT WWW.WITCHSNIGHTOUT.COM AND WWW.THEGIFTOFWINTER.COM FOR MORE DETAILS ON THESE TWO CLASSICS RELEASED BY THE ORIGINAL CREATORS. AWESOME STUFF YOU HAVE HERE THANKS AGAIN.